Do you ever walk into your home office and feel overwhelmed? Like a paper tornado spun through your room and threw documents, receipts, and work supplies everywhere? Yep, that is basically how I feel walking into my husbands office. If you are like me, it causes stress and anxiety walking into that mess. And also, like me, I’m guessing you are struggling to find the right desk for your space to help you feel more organized? 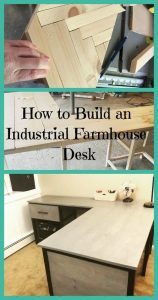 Read on, dear one, because I will show you how to build the perfect DIY industrial farmhouse desk for a small home office.